Processes requiring pure water must continually replace the water being consumed. Sources of replacement water are usually local supplies from a river or lake and therefore require pre-treatment and purification before it can be used in the process. After preliminary purification which may include filtration, clarification and softening, further downstream, a two-pass reverse osmosis system and demineralization operations are typically employed to further purify the water. Osmosis is the natural tendency of a fluid, usually water, to pass through a semipermeable membrane from a less concentrated solution into a more concentrated one, thus equalizing the concentrations on each side of the membrane. In reverse osmosis (RO), pressure must be exerted on the side with the concentrated solution to force the water molecules across the semi-permeable membrane to the fresh (pure) water side. This semi-permeable membrane inhibits the majority of dissolved impurities from passing through to the pure water side. The amount of impurities carried over depends on the type and condition of the membrane (i.e. age, cleanliness) and the amount of pressure applied (energy) to the process. Not all the feed water passes through the membrane. Some is diverted to flow over them to cleanse away the rejected impurities in a cross-flow filtration mode. The RO system produces one purified water stream called permeate and a second stream called concentrate, brine, or reject. Feedwater enters the machine at fairly low pressure and flows through pre-filters to remove suspended particles, such as silt. Pre-filters are typically a replaceable cartridge type which provides a cost effective method for keeping the membrane clean. Typical life expectancy for these membranes is approximately three years. RO systems are designed for automatic operation and require routine preventative and corrective maintenance. Common problems include membrane fouling and the use of improper flow rates. The result is reduced throughput capacity and shortened runs. Membranes can fail altogether, resulting in excessive demand on downstream purification systems and poor quality product water. 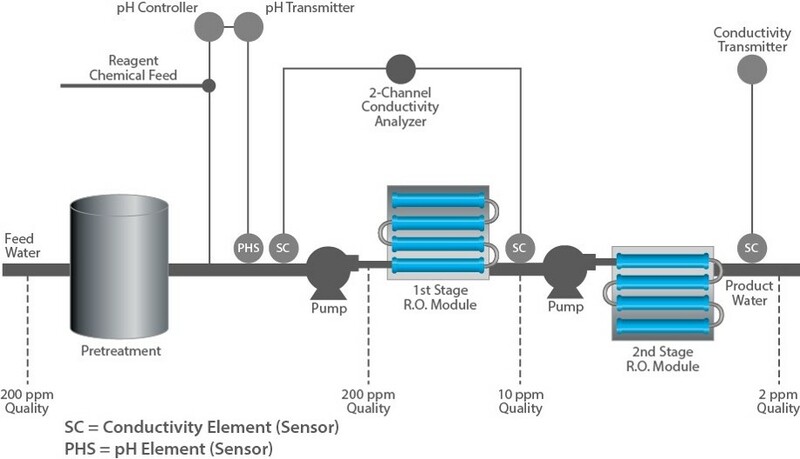 Both pH and conductivity measurements are used to safeguard the successful operation of an RO system. Some types of RO membranes are sensitive to feed water pH and can become damaged if the pH is outside the recommended range of 5 to 8 pH. A pH sensor upstream of the membrane can provide a feedback signal to control dosing of acidic or basic reagent to maintain the pH within acceptable limits. 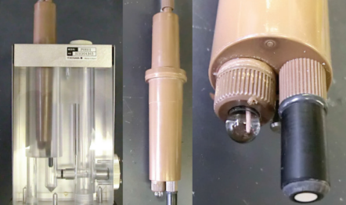 Conductivity measurements are used at both the inlet and outlet of the RO unit to determine whether the total dissolved solids are being filtered effectively. 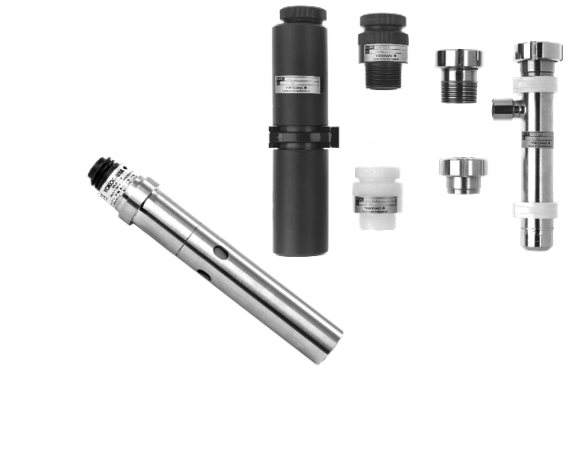 Reverse osmosis systems can remove up to 100% of suspended solids and approximately 90% of dissolved solids, dissolved silica, alkalinity and hardness. A common use for RO is for purifying water, removing salts and other impurities to improve the color, taste and other properties. It is regularly used forcommercial and residential water filtration and is also one of the methods used for desalinization of seawater. RO systems are capable of rejecting bacteria, salts, sugars, proteins, particles, dyes, and other constituents which have a molecular weight of greater than 150-250 Daltons. The separation of ions with reverse osmosis is aided by charged particles. This means any dissolved ions which carry a charge, such as salts, are more likely to be rejected by the membrane than those that are not charged, such as organics. The larger the charge and the larger the particle, the more likely it will be rejected. The majority of RO membranes are negatively charged when they are operated within the pH levels most commonly encountered in water applications. A two-pass RO system is typically installed upstream of the demineralizer. 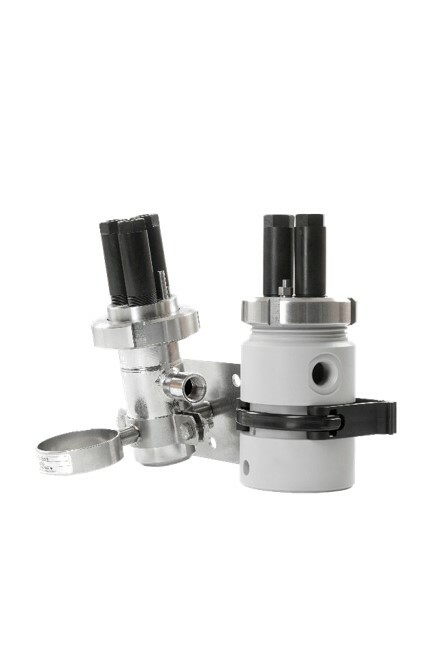 Its performance is pH dependent with the second-pass section most dramatically affected. While these changes are not significant in the majority of applications, variations become crucial to the success of high-purity water processing. In addition, the effect of minor feedwater constituents, such as alkalinity and ammonia also play a role in achieving high-purity permeate. For example if the inlet water had 200 ppm of dissolved solids and the outlet water had 10 ppm, the efficiency would be 95% rejection rate. A typical range for this type of application is 80% - 100% rejection. A final conductivity measurement after the 2nd stage is often used to determine the absolute quality of the outlet water. Ammonia also affects the production of high purity water and may be present due to municipal chlorination of feedwater or from organic contamination. Ammonia (NH3) will through the membrane system in either the molecular or ionic (NH4+) form. Ammonium hydroxide is less conductive than ammonium carbonate [(NH4)2CO3] so it is not uncommon to find off-line samples or storage tank water with conductivity higher than that of on-line readings. The pH values will be lower. This shift in pH is due to absorption of CO2 from the air and the formation of carbonic acid in the water. Without the presence of ammonia, this type of contamination of high-purity water with CO2 would generate higher conductivity as well as the reduced pH. 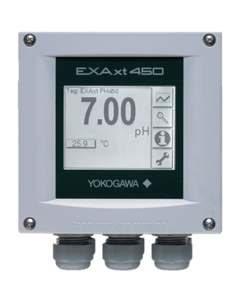 The PH450 pH and ORP analyzer is a multivariable analyzer that combines pH with temperature and ORP (Redox) measurement, which can be utilized through different output functions: two mA current outputs, four independent SPDT contact outputs and HART. 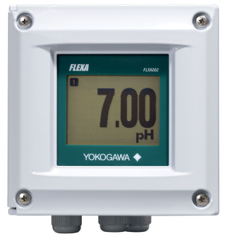 Yokogawa has invested considerable design and development time in producing a full range of fittings with particular emphasis on designs that reduce installation and maintenance time and consequently save operation costs. 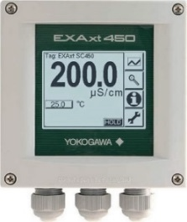 The EXAxt450 series covers all Conductivity Applications including all special software functions in the standard analyzers to reduce the number of configurations. This results in less inventory and less training needs for users that have multiple Conductivity applications.